Every night I take Jack to the bathroom and give him a bath. Last night was no different. I let him grab a few toys like Buzz and Fly (an airplane), and we proceeded to head to the bathtub, our normal routine. I start filling the tub, take off his clothes and picked him up to place him in the water. The minute the water touched his toes, it happened. Kim has been doing such a great job with this whole potty training business, since she’s a SAHM she has been responsible throughout the day to make sure he starts using the “potty.” Well every night, as I was saying, I give him a bath. Normally before the bath I ask him if he needs to go potty. He says yes, and I take him and place him on the big toilet, he does his business and flushes. Last night, I forgot that step. So the water touches his toes and he begins peeing. 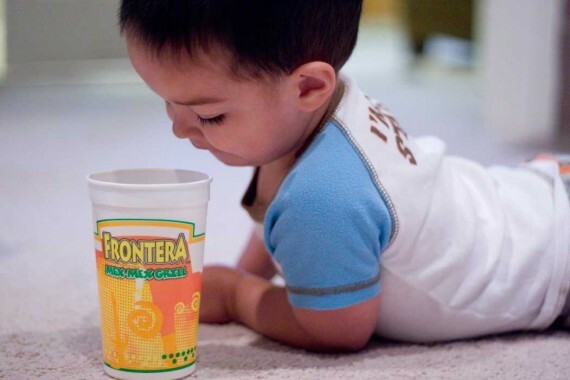 Using my ninja skills I grabbed the Frontera cup that we use to wash his hair and I catch the pee in the cup before it splashes down. Ok I wasn’t that quick but I got the majority of it in the cup. I take the pee, pour it in the toilet and flush. I washed out the cup, finished the bath, and put him to bed. I didn’t think twice about what just went down. Fast forward to this morning on my way to work, I get a phone call from Kim and she says, “You will NOT believe what YOUR son just did.” I love it how when he gets in trouble he’s MY son. She begins telling me that she went to do her normal morning routine with Jack where she asks him if he needs to go potty, she takes off his pullup, or underwear or whatever, and sends him in the bathroom to sit on the potty. She said he was in there a while, so she went to check on him and there he was. Cup in hand and peeing in it. Kim said something which startled him causing him to finish outside of the cup. Prior to being startled, apparently he was aiming very well. Good job Jack. So I respond to what she’s telling me with a “Oh no,” and it clicks with her. “You taught him that? !” I told her the bathtime story, and we laughed. Buddy was just mimicking exactly what I showed him the night before. What did I learn? How about an instant Proverbs 22:6. Time for y’all to share now, what was one funny thing you did where your child instantly mimicked you? No stories yet, but man this was a great post! LOL! Peeing IN the cup. Classic! Dude, this is awesome! I love stories like these. I don’t know, but in addition to shaking my head, I would be a little proud. My boy has reached a skill of pointing and shooting perfectly into a cup. * I though your story was going to end on someone else using the cup to gargle with water or something. LOL. Thanks for sharing Ben. Love these kind of family / kiddie moments. OH, man… LOL that would be terrible, but hilarious! Like mistakingly grabbing the Preparation H tube instead of the toothpaste and then…well, you get the picture. Welcome to my “Boy World”…gotta love these Nunes boys! I could sit here and write for days about my “Boy World” with Dk and Chino-Panda Nolan. Makes me think! You know what? we are doing okay as parents, we are the biggest influence in their lives, we are an example. This really spoke to my heart because I can relate but also made me realized that I am a huge part of my kids future. Just like you and Jack….he’s still little yet learning from something so simple or “ordinary” like a bath and a cup…..imagine all the things you will get to teach your SON, and the main one is to lead him to Christ, Salvation and experience EXTRAORDINARY for the rest of his life. Give Jack hugs, tell him it’s okay to pee in the shower (all boys do), to pee in the front yard (like Nolan) and pee all around the toilet cause’ mama will clean it! So right Chelly, thank you for sharing. What you guys are doing now with DK and Nolan is nothing short of amazing. So proud of you and Chris. Oh, and I crack up every time I see my mini me doing something I totally would have done, and I crack up even more thinking that there are TWO mini Chris’s running around. OMG! YES! I got big daddy kid and 2 little monkeys! Monkey see, monkey do!…..ay que monos! Wow! @ Michelle! That is an incredible message for ALL of us. Yup, I can share stories of my boys also – – – 🙂 The greatest one I love talking about is their journey to watching them become Godly Men, and leading THEIR son(s)…..and DAUGHTERS….to the gift of Jesus Christ. I think I laughed harder the second time around! lol, this was a good, teaching moment. For me. Don’t have kids. But I do have one when I was younger. I was probably about 3 yrs old and was watching my dad shave. I had to try this so I tried to use his razor when he wasn’t home and ended up cutting my lip and bleeding. So, if Jack ever sees you shaving you should invest in a toy razor with some play shaving cream. haha. Ouch! Jack watches me shave all the time, I didn’t even think about that. Great advice, lol. We couldn’t quite figure out what she was doing until one evening my wife called me from the other room. Gobbledeygook, LOL. I always thought that was an italian dish of some sort, at least that’s how Tony Soprano pronounced it. Ooh yeah, some gobbledeygook with a little prosciutto and parmesan…magnifico! Classic! There is a story you can share for years. When my daughter was little I was racing dirt track stock cars every weekend. That almost meant I was working on the car in our backyard almost nightly. One night a friend was over helping and his daughter and ours were busy playing and laughing. I crawled out from under the car to retrieve a wrench and looked up to see my buddy’s daughter was standing on the floor jack and my daughter was pumping her up in the air. Then she left her down and they swapped places. I laughed so hard I could hardly see. That’s awesome, simple, FREE fun. Love it. Dude, I love this blog. Now, to show I’m not spam, I’ll go on to say how much this health information has helped me not have to study so much and you should be rated higher in google. You will never know if I’m spam or not now, will you? LOL @Duane! He ain’t no spammer, wut? Well, when I originally wrote my comment, I realized how much it sounded like a stupid spam comment. And my avatar is a cartoon. I don’t have a lot going for me on this one. That is awesome. Loved reading this! Although many may think this is gross, a fist bump is definitely called for here. Tears of pride man, tears of pride. About shaving, Chris used to put shaving cream all over Dk’s “beard” and give him a spoon to use for shaving. Chris would shave and Dk would pretend….it was a bonding moment for both. Of course I always feel left out! LoL…..just saying! I don’t have a story that good, but my daughter does a dead on impression of my laugh. Awesome story. Thank you for the chuckle. We have 3 little girls- and all things “potty” are girly. Sit down, and use LOTS of TP. Once, my middlest daughter (and spunkiest) walked in on my husband doing his “boy potty trick” and attempted to do the same thing that HE had done on her next potty trip. She sort of sumo-walked over the toilet bowl in an effort to “aim”. Didn’t work so well for her. Big mess. It was only hilarious after-the-fact. Seriously, what’s up with using a half-roll each bathroom trip? At least he’s all set for long roadtrips now. My son is 3 months old, so he isn’t doing too much imitating yet. He shakes his fist at the Comcast truck pretty well, I guess. It’s high time I visited here. Hey Mo thanks for visiting! Shaking the fist at Comcast, or any utility truck is pretty awesome. It’s when a finger is involved that you might need to start worrying…maybe. Love it! And don’t you love how God teaches us stuff via parenting? Dang, if parenting isn’t more about ME than them! So glad I finally clicked over to your blog! I think my daughter pointed out your blog to me the first time I read it, somehow she found it through either something Disney related, or maybe OCC, I can’t remember. Haha, this is hilarious man. My little guy tries to mimic everything I do (he’s 2), so I’m sure I’ll have some funny stories to share here shortly. So yeah, Jack’s 2 too. I love when he mimic’s, and even more when he just makes up his own stuff.